When I first applied for a summer internship at Seahorse winery, proprietor-winemaker Ze’ev Dunie replied in his email: ‘but be prepared: this place is a jungle. Nothing in our vineyard is like you’ve learnt in books.’ I immediately knew he was my man. If nothing was the way I’d read in books, I’d feel at home – and I did. Ze’ev is a filmmaker-turned-winemaker who produces a wide range of wines, mainly from Mediterranean red grape varieties: Mourvedre, Syrah, Grenache, Petite Sirah and Zinfandel. He names his wines after his personal heroes: John Lennon, Antoine de Saint-Exupery, Roman Polanski… His flagship wine, though, is the white called James (as in James Dean), made from Chenin Blanc, and it was in the production of this wine that I assisted last summer. This year I returned to Seahorse to taste the wine. It didn’t disappoint. Pale lemon wine with a youthful, friendly nose driven by sweet, fresh fruit. Good acidity on the palate, coupled with stone fruit, perhaps some tropical hints as well. 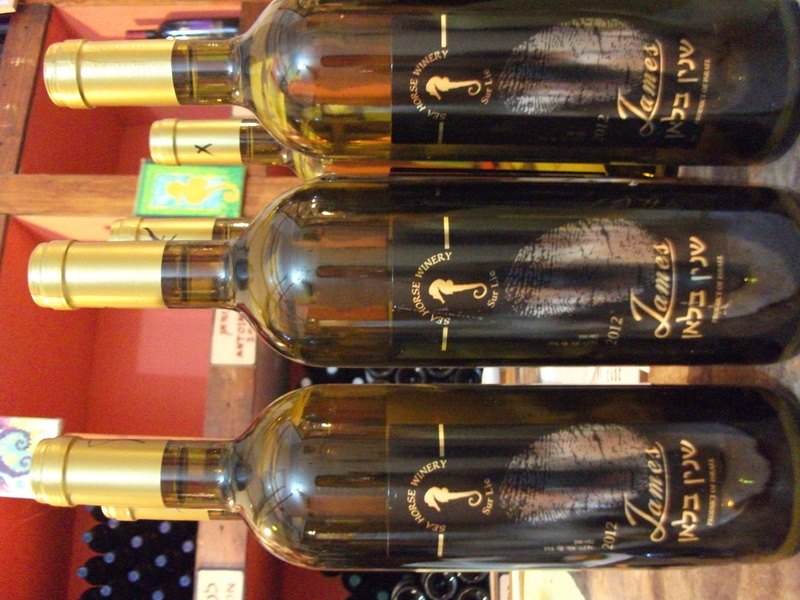 A clean, pleasurable, medium-bodied wine with a smooth palate and a fruity, mineral finish. There’s something romantic and lyrical about James. Delightful and refreshing in the summer – and very few people make Chenin Blanc in Israel, so this is a truly special treat! We picked the grapes early in the morning and carefully selected, by hand, the bunches we wanted to use. The grapes were destemmed and crushed mechanically and transferred by a pump into a gentle pneumatic press. After the juice was pressed, we pumped it over into stainless steel tanks where it would be cooled and left to settle for a couple of days. Since the main feature of this wine is its youthful, fruity freshness, it is important that the lees make little impact – therefore the juice had to be as clear as possible when it was pumped over into the barrels where the fermentation was to take place. So the sediment at the bottom of the tanks was left alone. When the cool, clean juice was sitting in the barrels, we added yeast, and within 24 hours fermentation began. This is what Ze’ev calls the music in the cellar. And it is indeed music to the ears of those who have worked on making the wine, as it is a sign that everything is going according to plan. Fermentation sometimes takes a lazy start and sometimes doesn’t begin at all. But last year we were lucky and all the barrels were making beautiful bubbling music. When fermentation is over, the wine is left to mature in the barrels at a low temperature so that malolactic fermentation doesn’t set in. (Malolactic is a second fermentation where malic acid in the juice is transformed into lactic acid; this process is desirable in most red wines and certain whites such as Chardonnay as it provides body, fatness, creaminess to the wine and adds layers of complexity to the simple fruit. In a wine like our James, however, all the above would have been undesirable, and so malo was to be avoided.) 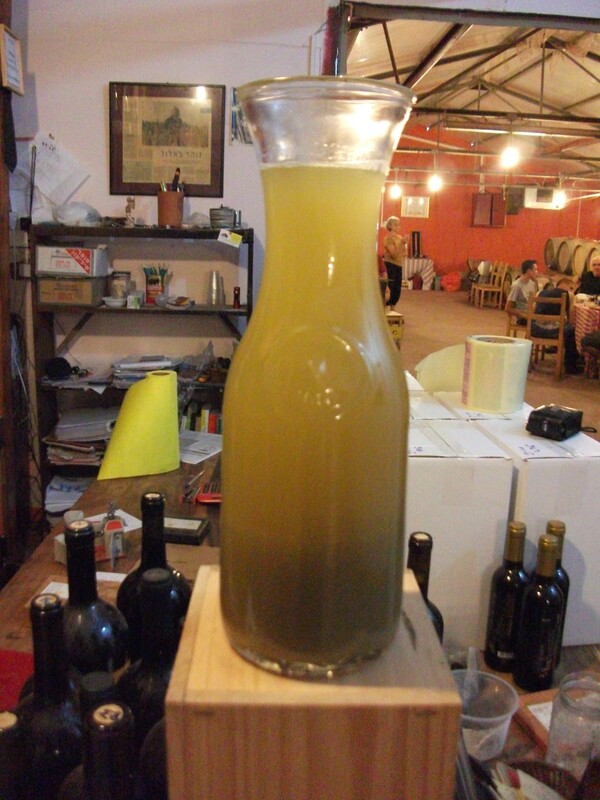 The wine is finally filtered before bottling, again to ensure no further fermentation.